As a part of Cherry Mobile and Lazada's CNY celebration, they're also putting some of their desirable laptop / tablet hybrid on sale. One of them is the goodness of Cherry Mobile Alpha Morph Dual Boot that runs both Windows 10 and Android 4.4 Kitkat OS. 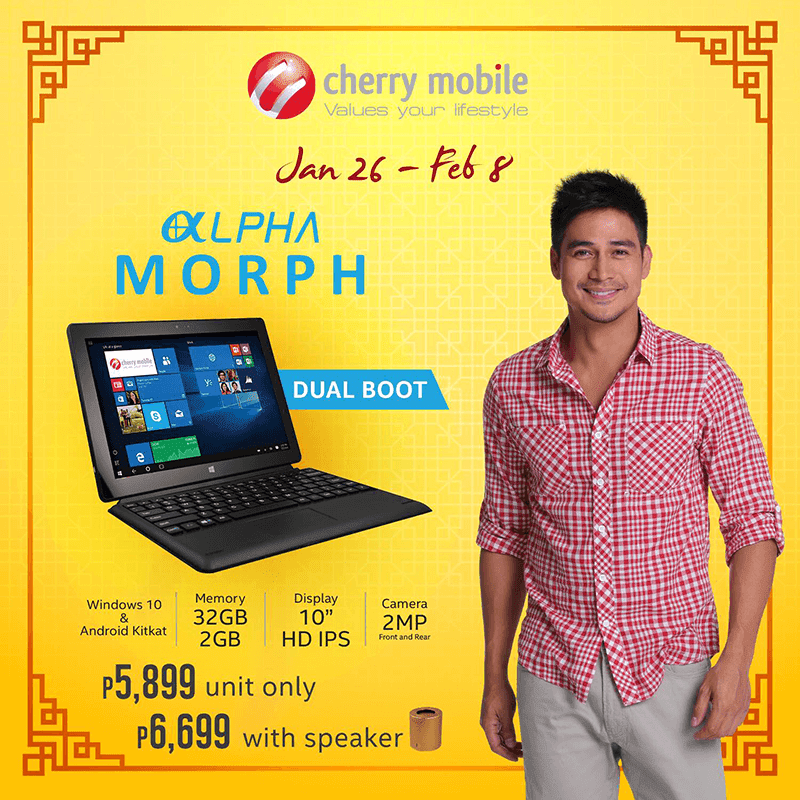 In case you missed it, the Cherry Mobile Alpha Morph Dual Boot laptop / tablet hybrid features a 10.1 inch HD screen and runs with Intel Atom Z3735F quad core processor paired with 2 GB of RAM and 32 GB of ROM. It's a setup that's great for students and everyone on the go that wanted a productive device that can also be used for entertainment purposes. Previously priced at 7,999, the above mentioned device will go on a discounted price of 5,899 if you only want the unit and 6,699 if bundled with a Pyxis X1 Mini Bass speaker. The sale is available until February 8, 2016. Pretty good deals right? Related: Cherry Mobile Alpha Play goes on sale too for 3,888 Pesos only! Click Here!